Nothing beats graphite for drama and impact, and this pencil creates all the dramatic effects you could wish for, and more. Used dry, the soft, wide strip is perfect for loose, free sketches and bold line drawings but add water and you’ll bring a totally new dimension to your work. Watch the graphite gently dissolve into subtle tones, adding a softness and charm to any style of drawing. Available in three versatile degrees, it opens up an exciting new world of line and wash sketching. 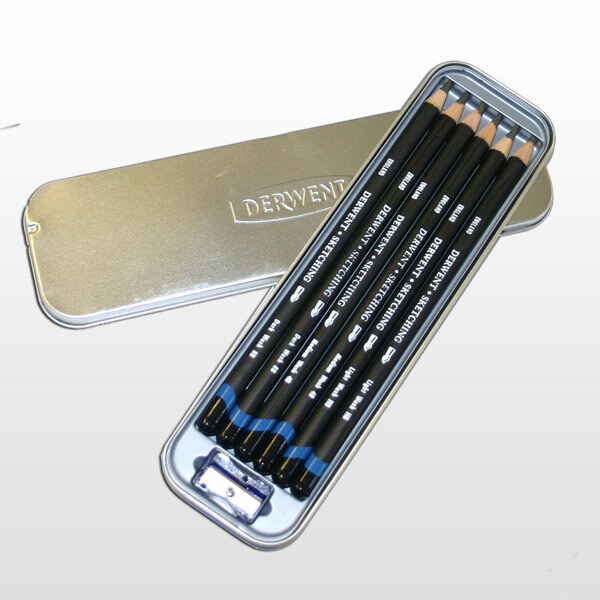 This metal tin contains 6 watersoluble sketching pencils, ideal for creating expressive tonal drawings and line and wash sketches. Includes free sharpener.